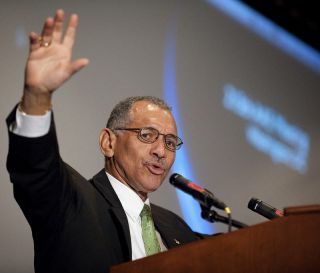 NASA Administrator Charles Bolden, a former space shuttle commander, speaks at the 215th Meeting of the American Astronomical Society in Washington, D.C.
WASHINGTON ? The United States must reach outto other countries to increase international cooperation in space, NASA chiefCharles Bolden told an audience of astronomers this week. It's notacceptable for the United States to come up with a space plan on its own, andthen invite other countries to participate, Bolden said. "Wehave got to make them true partners, which means they sit at the table when youplan," he said. "We have incredibly talented partners and we have tolearn to trust them." Bolden saidcreating a future with broader internationalpartnership will enable better missions, because costs and expertise wouldbe shared, and will also serve to improve America's reputation in the world,where images of U.S. soldiers marching through foreign lands are often the mostsalient association people have with America. He spokeTuesday at the 215th meeting of the American Astronomical Society in Washington, D.C., calling for "a relationship where our partners are treated asequals." A formerastronaut, Bolden was nominated as NASAadministrator by President Barack Obama, and confirmed in July 2009 by theU.S. Senate. He is a veteran of four space shuttle flights, including themission to deploy the Hubble Space Telescope. Bolden iscurrently presiding over an agency with an uncertain future. President Obama isreviewing NASA's plans, which include building new spacecraft to carry humansto Earth orbit, backto the moon, and beyond. But the President has not yet made a decisionabout whether to charge NASA with a new vision, or to carry on with its currenttack. "Idon?t know what the president's decision is going to be," Bolden said,though he was confident that President Obama would carry on a strong program ofscience and exploration. "I do not see this present being the presidentwho presided over the end of human space exploration." He said anincrease in funding would be necessary to keep America's human space programstrong, but he promised to put the interests of science in line with those ofexploration. "I canmake this commitment to you: The future of human spaceflight will not be paidfor out of the hide of the science budget," he said, to strong applausefrom the researcher audience. Bolden alsolaid down a challenge to the listening astronomers to reach out to the publicto communicate the excitement of science, and to work harder to educate thenext generation. "Ineed for you to get out and do things you're not accustomed to doing," hesaid. "We are going nowhere, nowhere, if we don't educate our kids." He said toomany scientists leave it to teachers to educate children about science, but toomany teachers are afraid to teach science and math. "Weare leaving a generation behind," he lamented.